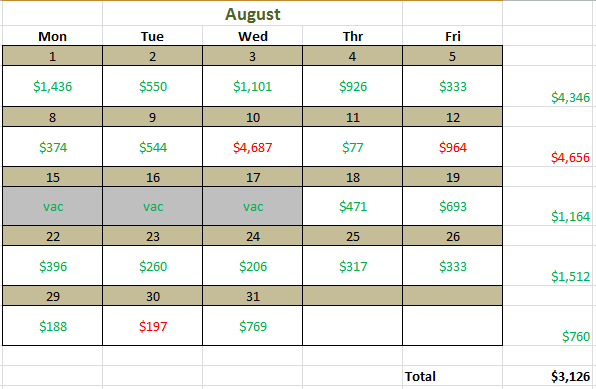 I am ending the month of August with a profit of $3,126-after commissions! I had only 3 losing days. This is a great achievement because it showed consistency in my trading. Overall I am very proud of my performance this month. The good this month: I focused on entry and traded more conservatively. This caused me to miss some trades but reduced my headache trades substantially. For the second half of the month I did not step in front of any big parabolic moves. I waited for a defined risk. I was much more cautious on my adds buy trying to add only where I would get in the trade in the first place. Probably the most important thing I did the second half of the month… I respected my stop loss targets and cut my losses when I was proven wrong on the trade. I did not just add add add. This resulted in me being able to make back the small losses on the starter positions where I stopped out—ending many days in the green that started red. The bad this month: I ignored my stop losses on two trades, OPTT and REN. The latter ended in a huge loss that whipped out the entire first week of trading. I paid dearly for this stubborn hold, but I learned my lesson for the second half of the month. I think I am ready to increase my size for September. 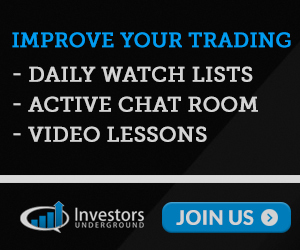 I would like to go from 1000 to 3000 share positions to 2000-6000 share positions. I feel I am ready for this due to two reasons. My consistency has been really good for many months. Second, I am willing to respect my max stop loss. My new max stop loss will be $2000.